Sharing the billing with the Wharfedale 1st XV at home on Saturday did not appear to daunt the Foresters one jot. 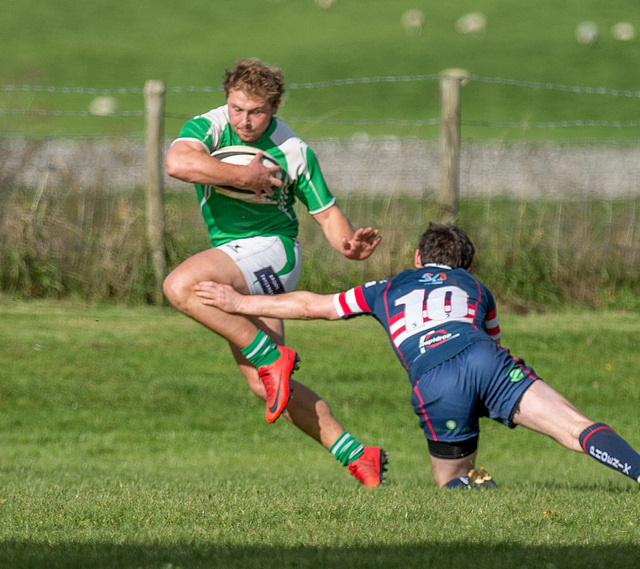 The Faithful were treated to glorious feast of running rugby as the men in green surpassed their 59 point haul against Yarnbury with twelve tries and six conversions against a Doncaster side that had talent and effort. In fact just before half time a score of 19-10 to the Foresters suggested that they would have a fight on their hands. Doncaster started the stronger with good possession and a series of rucks that Wharfedale defended effectively, causing a knock on and a scrum on the home side’s ten metre line. A powerful scrum led to an outstanding break by Kristian Sharples, well supported by Josh Prell which should have led to a Wharfedale try but a missed last pass went into touch. This passage of play was the second half in microcosm; solid defending when necessary, strong scrummaging, quick ruck ball and a back line, orchestrated by Rory McNabb, that had too many ideas and too much pace for Doncaster. The first score went to Max Bell. With the Foresters camped in the Donny half the ball was worked wide well and Max crossed unopposed into the corner. Try converted 7-0 to the Foresters. The next score went to the forwards. A superb scrum drove the visitors back twenty metres and a scintillating break down the left wing by Eddie Gill ended with Simon Borrill scoring out wide. 12-0. The forwards were enjoying the better of the loose play and a powerful surge from George Altham provided the impetus for Josh Prell to touch down in the corner with another excellent kick from McNabb. 19-0 to Wharfedale after 20 minutes. The next quarter belonged to Doncaster. They offloaded impressively in attack and their pacey backs handled well. Wharfedale defended stoutly but Doncaster’s possession and persistence eventually led to their forwards driving over in the corner for a try that was quickly followed by neat interplay between backs and forwards. The Doncaster centre crossed the line wide out. 19-10 to the Foresters with Doncaster definitely back in it. With the final play of the half Wharfedale had breathing space. Another stunning break from Prell down the right led to a perfectly executed cross field kick from Rory McNabb to winger Eddie Gill on the left meant try time. 24-10 to Wharfedale at half time. Breathing space became clear blue water within five minutes of the re-start as scrum-half Will Lawn recorded what must be the fastest ever hat-trick of tries; one set up by the forwards, one a fantastic solo effort and one the result of awesome back play. All tries were converted by McNabb. 45-10 to the Foresters. Doncaster never recovered from the Lawn onslaught and the rest of the half was dominated by Wharfedale. The backs ran riot, with Kristian Sharples, Josh Prell, Ralph Wellock, Eddie Gill and Ben Blackwell, from the bench, all displaying outstanding pace and skill. Wharfedale’s bench was once again fully utilised and showed just how much depth there is in this squad. Matt Colgrave impressed in the loose and with ball in hand after coming on for injured 2nd row Elliott Stockton and James Huck, Jake Starkey and Sam Mason all played key roles in Wharfedale’s dominance. Eddie Gill completed his hat-trick, Will Lawn scored another to edge Eddie out on tries, Josh Prell bagged a brace and Kristian Sharples topped his outstanding performance with a try. Rory McNabb converted six times and grew in stature as a game controlling fly half. This was an exceptional performance, backs and forwards in harmony in attack, a strong set piece and the committed defence that is the hallmark of this young side. Tom Whyte led by example throughout and should be proud to captain this promising group of players.